Jason Calvin Garrett (born March 28, 1966) is an American football head coach of the Dallas Cowboys of the National Football League (NFL). Garrett was the offensive coordinator and assistant head coach of the Cowboys before being promoted to interim head coach after the firing of Wade Phillips on November 8, 2010. He is a former professional American football quarterback in the National Football League for the Dallas Cowboys, New York Giants, Tampa Bay Buccaneers and Miami Dolphins. He played college football at Princeton University. Garrett went to prep school at University School in Hunting Valley, Ohio, and was a letterman in football, basketball, and baseball. In football, as a senior, he won All-League honors as a quarterback and safety. He graduated from University School in 1984. Garrett attended grade school at Holy Cross school in Rumson, New Jersey. Garrett accepted a scholarship from Princeton University, where he began as the starting quarterback of the freshman team, registering 64 completions on 116 attempts for 996 yards. He transferred to Columbia University when his father, Jim Garrett became the head coach in 1985. Following his father's resignation after Columbia's 0–10 1985 season, although none played varsity for different reasons (Jason was an ineligible transfer), he and his brothers (Judd and John) transferred to Princeton University. He sat out the 1986 season because of the transfer rules, while focusing on running the scout team that included his brothers. The next year he was named the starter at quarterback as a junior. Although he piloted Princeton to a win against his former team Columbia where they set the Division I record for straight losses (35), he also was involved in a losing effort against them as a senior, snapping Columbia's 44-game losing streak. He received the Asa S. Bushnell Cup as the Ivy League Player of the Year. He earned a degree in history in 1989. He finished his college career completing 366 of 550 passes (66.5%) for 4,274 yards and 20 touchdowns. At the time he was ranked in the categories: lowest pass interception percentage (1.8% – school record), total yards of offense (4,555 – second in school history), total yards of offense in a season (2,485 third in school history), most passing yards (4,274 – second in school history), most passing yards in a season (2,217–- fourth in school history), most completions (366 – second in school history), most completions in a season (204 – third in school history), most touchdown passes (20 – tied for fourth). He continues to hold the Ivy League career record for completion percentage with 66.5% (366–550) and his 1988 percentage of 68.2% (204–299) stood as the league record until 2000, when Gavin Hoffman posted a 70.5% mark. Garrett was signed as an undrafted free agent by the New Orleans Saints after the 1989 NFL Draft and was eventually signed to the practice squad. On September 3, 1990, he was waived by the Saints and spent most of the year working as a coaching assistant for the Princeton Tigers. In 1991, Garrett started at quarterback for the San Antonio Riders of the World League of American Football, but suffered a separated right shoulder in the season opener, he would return to start the sixth and seventh game, but was passed on the depth chart by Mike Johnson. On June 4, 1991, he was signed by the Ottawa Rough Riders of the Canadian Football League, but was released in August. In 1992, with the support of his father who at the time was a part of the Dallas Cowboys scouting department, he was signed as a free agent. He was released on August 31 and later signed to the team's practice squad. In 1993, his preseason performances allowed him to make the team as the third-string quarterback behind Troy Aikman and Hugh Millen. He eventually passed Millen on the depth chart and when in the eighth game of the season Aikman injured his left hamstring against the New York Giants in the third quarter, Garrett finished the game completing 5 of 6 passes for 34 yards and leading 2 touchdown drives. He was named the starter for the next game against the Phoenix Cardinals, where he completed 2 of 6 passes for 25 yards and helped the team score on a field goal, before being replaced on the third series in favor of Bernie Kosar who was signed 4 days earlier for depth purposes. Kosar became the backup quarterback for the rest of the season after the game. The highlight of his playing career occurred on the 1994 Thanksgiving Day game when he started in place of backup quarterback Rodney Peete, who was out with a sprained thumb he suffered in a win against the Washington Redskins, and led the Cowboys over the Green Bay Packers by completing 15 of 26 passes for 311 yards and 2 touchdowns in a second-half for a comeback win of 42-31, which earned him NFC Offensive Player of the Week honors. In 2008, that game was named the fourth-best moment in the history of Texas Stadium by ESPN. The next year he was promoted to the backup position and in the second game against the Denver Broncos, after Aikman suffered a broken clavicle, Garrett came in to finish the 23-42 loss. He would start the next five games and contribute to a 3-2 mark for a team that would go on to win the NFC East conference by one game over the Arizona Cardinals. In 1999, he started two games for a 1–1 record. He was a part of the 1993 and 1995 Super Bowl winning teams. In eight seasons with the Cowboys, he played in 39 games and completed 165 of 294 passes (56.1%) for 2,042 yards, 11 touchdowns and five interceptions with a 6-3 record. In 2000, he was signed as a free agent by the New York Giants to be the backup for Kerry Collins. On February 27, 2002, he was released for salary cap reasons and re-signed on July 24, although he would be declared inactive in 16 games, after being passed on the depth chart by Jesse Palmer who was named the backup quarterback. In 2003, he was declared inactive in 11 games as the third-string quarterback. On March 15, 2004, he signed with the Tampa Bay Buccaneers and was cut on August 31. On October 13, he was re-signed by the Tampa Bay Buccaneers. After being declared inactive in week 6 and week 7, he was released on November 6. On November 24, he was signed as a free agent by the Miami Dolphins and was declared inactive for the last 6 games of the season. After retiring as a player, he became the quarterbacks coach for the Miami Dolphins in 2005–2006 under head coach Nick Saban. In January 2007, Garrett was hired by the Dallas Cowboys as offensive coordinator. He guided the Cowboys to the 2nd best offense in the NFL, which made him an attractive head coaching prospect. In January 2008, Garrett interviewed for the head coaching job of the Baltimore Ravens and the Atlanta Falcons receiving offers from both, but ultimately opted to remain in Dallas. His salary for the 2008 season was nearly $3 million; the highest salary for an assistant coach in the NFL at the time. On December 29, 2008 the Detroit Lions received permission to speak to Garrett regarding the team's head coaching vacancy according to ESPN sources. In January 2009, the Denver Broncos also interviewed him as a possible replacement for fired coach Mike Shanahan. He was also a finalist for the St. Louis Rams head coaching position, to replace Jim Haslett, the interim head coach. Ultimately, he lost the job to Steve Spagnuolo. On November 8, 2010, he was named as the Dallas Cowboys' interim head coach following the firing of Wade Phillips after the Cowboys' 1–7 start for the 2010 season. On November 14, Garrett won his first game as a head coach, beating the favored New York Giants 33–20 in the Meadowlands. The next week, he led the Cowboys to a 35–19 victory over the Detroit Lions, their first home win all season. He finished with a 5-3 record down the stretch. On January 6, 2011, Garrett was named the official Cowboys head coach; the 8th in Cowboys history, and the first born during the team's era. He had three straight average 8-8 seasons, losing in the last game each season to NFC East division rivals New York Giants, Washington Redskins and Philadelphia Eagles to miss the division championship and the playoffs each time. 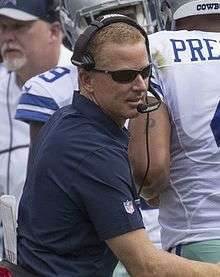 In the 2014 season, Garrett achieved head-coaching success for the first time. His Cowboys, featuring several key draft picks maturing as the league's best offensive line and the emergence of DeMarco Murray as a dominant running back, won the NFC East with a 12-4 record and were tied for the best record in the conference with the Green Bay Packers and the Seattle Seahawks. The Cowboys were undefeated on the road, including impressive wins over Seattle and the NFC East frontrunners (at the time) Philadelphia Eagles. Garrett's team lost the three-way tiebreaker to Green Bay and Seattle and therefore hosted the Detroit Lions in a Wildcard game. This game, won 24-20 by the Cowboys, featured a controversial "flag pick up" after a penalty during a late Detroit drive, thereby allowing Dallas an improved chance to make a comeback and defeat the Lions. In the ensuing Divisional Playoff game, hyped as a rematch of the famous Ice Bowl NFL championship game from 1967, Dallas held a lead in the second half, but after losing the lead due to a late Aaron Rodgers touchdown pass, had a potentially game-winning catch by Dez Bryant overturned in official replay, therefore sealing a 26-21 defeat to Green Bay. On January 13, 2015, Cowboys owner Jerry Jones and Garrett came to an agreement of a contract, keeping Garrett in Dallas for five more years and paying him $30 million. Garrett has now head-coached the Cowboys longer than any other coach except Tom Landry. The Cowboys entered the 2015 season with great expectations, but starting quarterback Tony Romo only played in 4 games after suffering two fractures in his left collarbone, and the team finished with a 4-12 mark. Jason's brothers, John and Judd, also played in the World League of American Football, and Judd made second-team All-World League in 1991 after leading the league in catches. John is currently wide receivers coach for the Tampa Bay Buccaneers, and his younger brother, Judd, works in the Dallas Cowboys front office after being let go as tight ends coach for the St. Louis Rams. Since he played for the London Monarchs, Judd is the only one of the Garretts who played in the WLAF to have a World Bowl ring. Another brother, Jim Garrett III, is an English teacher and former football coach at University School in Hunting Valley, Ohio. His father Jim Garrett was an assistant coach for the New York Giants (1970–1973), New Orleans Saints (1976–77), and Cleveland Browns (1978–84) and head coach of the Houston Texans of the World Football League (1974) and at Columbia University (1985). From 1987 to 2004, he served as a scout for the Dallas Cowboys. Garrett resides in Dallas with his wife, Brill. ↑ "A Tale of Lions, Tigers and Garretts". Retrieved February 19, 2016. ↑ Yannis, Alex (October 9, 1988). "COLLEGE FOOTBALL; Columbia Wins! That's Right, Wins!". The New York Times. ↑ "Jason Garrett coaching bio". Retrieved February 19, 2016. ↑ "2010 Ivy League Football Media Guide" (PDF). IvyLeagueSports.com. p. 77. Retrieved 2010-10-17. ↑ "Kosar steps in to lead Cowboys past Cardinals". Associated Press. November 15, 1993. Retrieved February 19, 2016. ↑ "Fans' Choice: Pick a comeback game to watch". NFL.com. 2013-03-28. Retrieved 2013-04-02. ↑ Luksa, Frank (September 15, 2008). "Legends, underdogs, goats shared Texas Stadium spotlight". ESPN.com. Retrieved February 19, 2016. ↑ Newberry, Paul (January 17, 2008). "After second interview in Atlanta, Jason Garrett decided to stay with Cowboys". USA Today. ↑ Mortensen, Chris; Werder, Ed; Mosley, Matt (17 January 2008). "Cowboys make Garrett highest-paid assistant in NFL". ESPN. Retrieved 2 January 2015. ↑ Oosting, Jonathan (December 29, 2008). "Detroit Lions get permission to interview Dallas Cowboys offensive coordinator Jason Garrett". Retrieved February 19, 2016. ↑ "Jason Garrett to Meet with Broncos as Denver Continues Coaching Search". Bleacher Report. January 6, 2009. Retrieved February 19, 2016. ↑ "Rams interview Frazier, Garrett". ESPN.com. January 14, 2009. Retrieved February 19, 2016. ↑ Boren, Cindy (November 8, 2010). "Wade Phillips fired by Cowboys after 3 1⁄2 seasons as coach". Washington Post. Retrieved 2010-11-08. ↑ McCue, Ian (November 10, 2014). "Cowboys Only NFL Team Undefeated On Road". 247Sports.com. Retrieved February 19, 2016. ↑ Parziale, James (January 4, 2015). "5 plays the Dallas Cowboys overcame to beat the Detroit Lions". FoxSports.com. Retrieved February 19, 2016. ↑ "The catch that wasn't? Refs overturn Bryant catch, Cowboys lose to Packers". Fox4News.com. January 11, 2015. Retrieved February 19, 2016. ↑ Gaither, Stephen J. (January 13, 2015). "Coach Jason Garrett, Cowboys agree to new deal". Sporting News. Retrieved February 19, 2016. ↑ "Jason Garrett Coaching Record". Retrieved February 19, 2016.